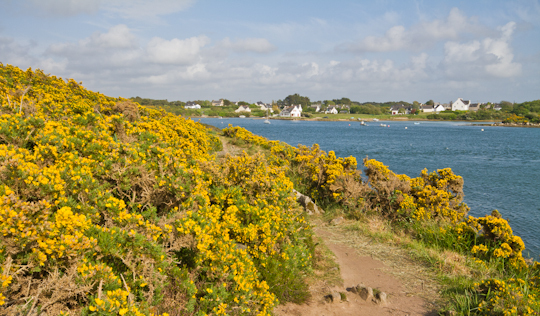 Over the Ascension weekend, I was once again drawn back to Brittany, to the southern coast, in the Morbihan. 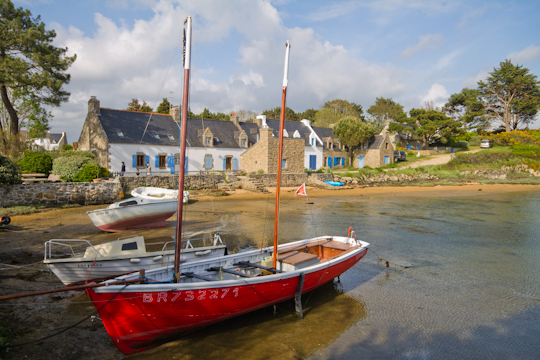 You can find five Brittany itineraries under Weekend Itineraries, including four that focus on various parts of the Morbihan. You can refer to those itineraries for the logistical details, but I share a few additional ideas for your time in the Morbihan below, along with photos showing the highlights of my latest trip. 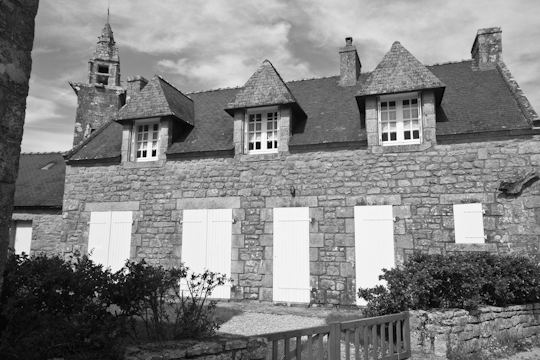 I returned to the hamlet of Saint-Colomban, in Carnac, with its beautifully simple stone church and stone houses. This time, we parked at the church and followed Chemin de la Falaise until it turned into a dirt path through green fields. At most ten minutes down this path is a beautiful stretch of beach and the GR34 (grande randonnée or long distance path) that you could follow for hundreds of kilometers in either direction. We were staying in the village of Saint-Cado, in the commune of Belz. I discovered Saint-Cado over Easter weekend and it is one of my favorite spots in all of Brittany. 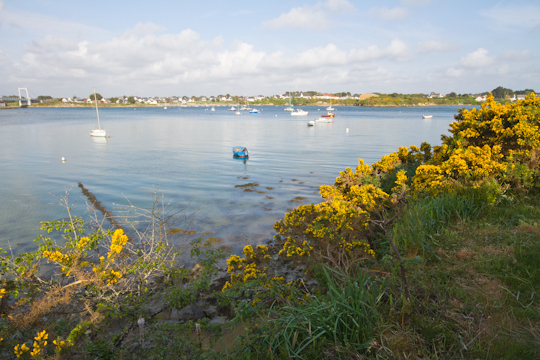 Saint-Cado is known for its small island that is connected to the mainland by a small stone bridge, and also for the lone house that sits in the middle of the Ria d’Etel, the estuary that spreads its tentacles into the land. 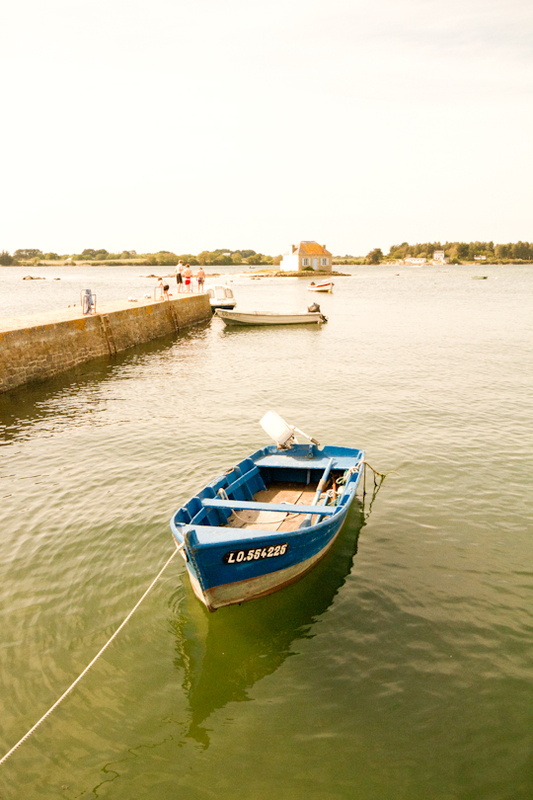 The island of Saint-Cado is about as picturesque as you can hope to find. Its residents seem quite content. And the estuary is not the only organism spreading stretching its tentacles. 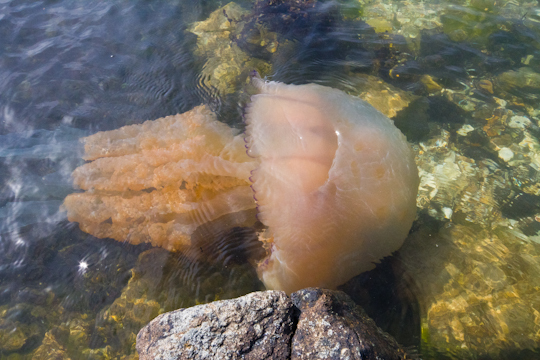 This enormous jelly fish on the northern side of the island was nearly three feet long! 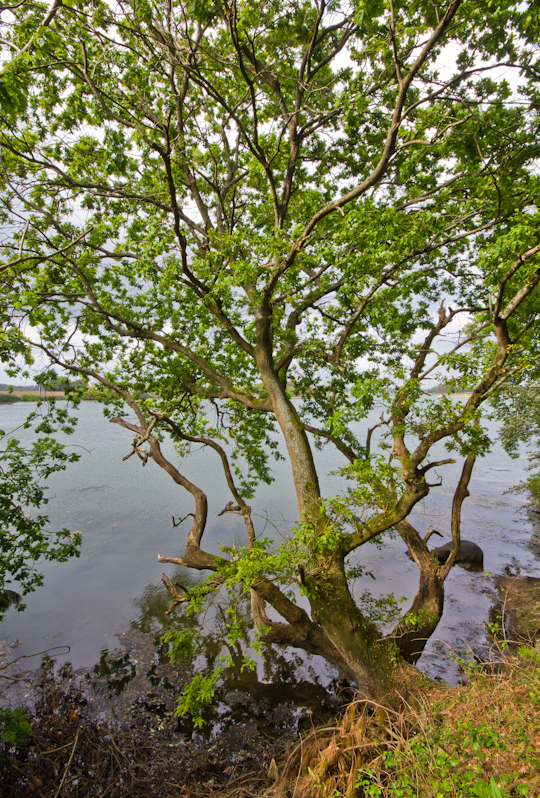 When you venture to the far corners of the Ria d’Etel, the landscape becomes wilder and less inhabited. 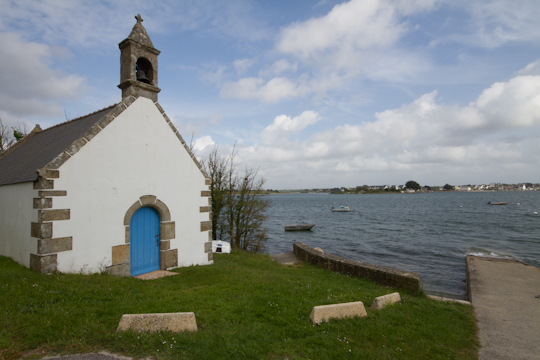 Be sure to stop at villages such as those of the Locoal-Mendon peninsula and this Chapel of St. Guillaume, with a view across the estuary back towards Saint-Cado. If you follow the path past the chapel, you can make a small circle of about 15 minutes, walking by beautiful homes and an old stone cross. On the other side of the Pont Lorois (bridge) from Saint-Cado is Le Vieux Passage, an idyllic little fishing port. 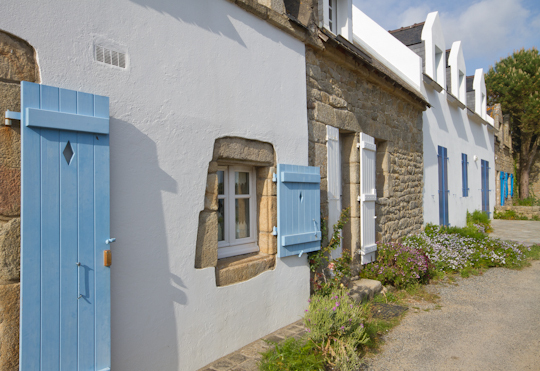 The homes of Le Vieux Passage are made of stone and especially beautiful in the early evening sun. 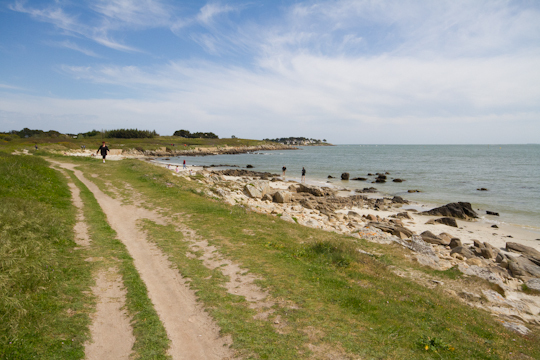 A walk along the coastal path starting in Le Vieux Passage is the perfect way to spend the last hours of daylight. 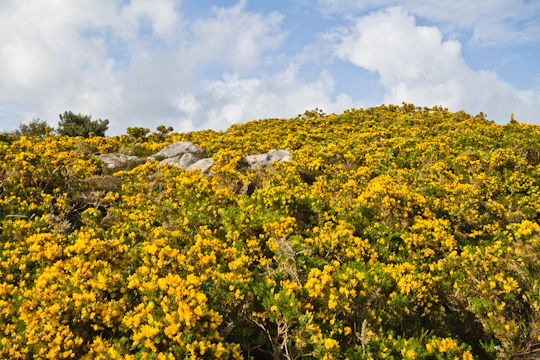 In mid-May, the hills were covered in flowering bushes, adding to the vibrance of this small community. This harbor that sits near the mouth of the Ria d’Etel is quiet and peaceful. You would not know that less than a mile from this lazy fishing village is the open ocean and sandy beaches as far as the eye can see. 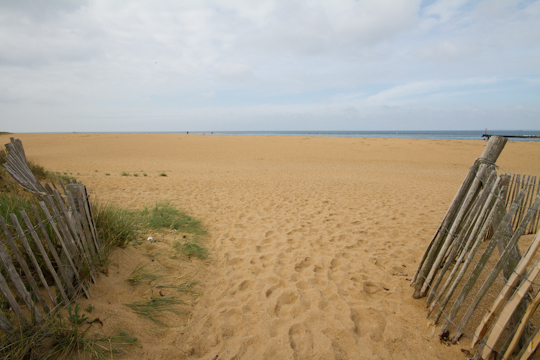 The Barre d’Etel (sand bank of Etel) guards the narrow opening of the Ria d’Etel and witnesses the violent current at this meeting place of the waters. 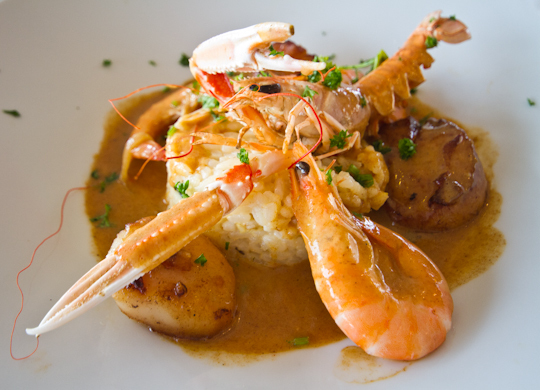 Le Bistrot du Marin in La Trinité Sur Mer: the restaurant is spacious, with a view of the port. The service was quite friendly and the seafood risotto was absolutely delicious (see photo below). Be sure to also stop by L’Epicerie du Port, just a few doors down from the bistro at 24 Cours Quais for gourmet and international food products at reasonable prices, including a wide variety of olive oils. La Brigantine in Carnac: seafood is of course their specialty, but everything we ate was delicately and perfectly prepared. Extremely friendly owners and delightful decor. Best to reserve in advance, especially for dinner. If you are looking for oysters, a stop in Larmor-Baden is a must. The Crénéguy family owns a small shop right by the port that sells oysters and several other shellfish and offers tastings. 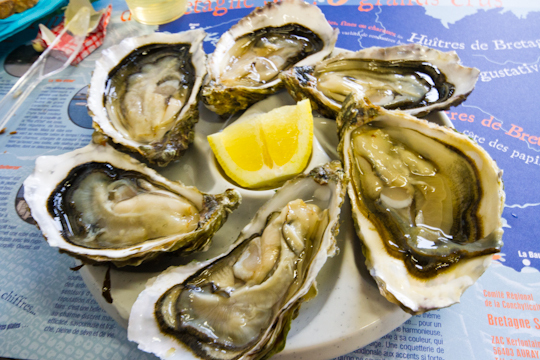 For less than €10, taste a plate of six of the freshest and plumpest oysters you will ever try (see photo above), plus bread & butter and a glass of white wine. The shop is open from 9h30 to 13h30 and from 16h to 19h30 every day and is located on rue de Pen Lannic. Call 02.97.58.04.76 to reserve or order in advance. La Goélette in Baden serves up some of the best galettes and crêpes around, as well as wonderfully flavorful moules marinières (mussels). 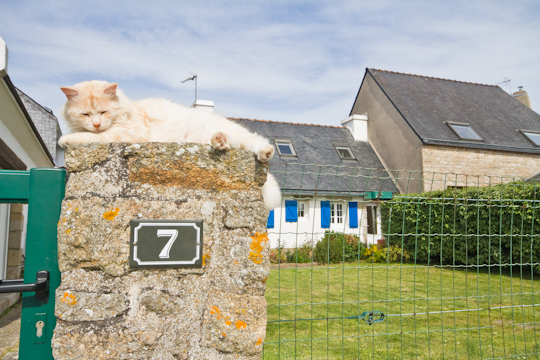 And I’ll be back in Brittany again soon!